It promises to make having blood drawn or getting injections far more comfortable and stress-free, but outside of a few testers (who are probably being well-compensated) who among us is willing to give a robot like the VenousPro a taste for human blood—specifically your blood? Using infrared and ultrasound imaging the VenousPro is able to see right through the skin on a human’s arm to the veins below, allowing it to pinpoint the ideal spot for a needle insertion. 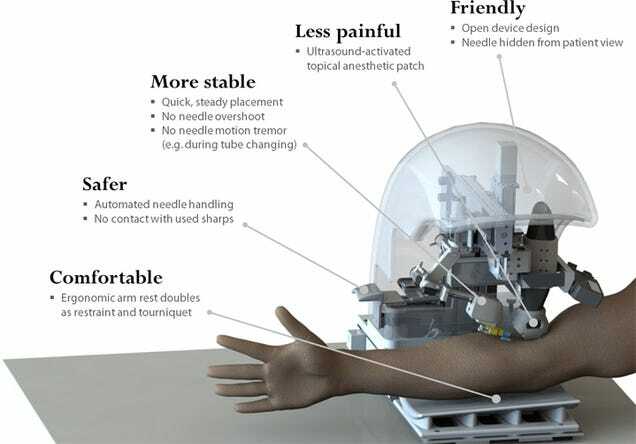 It’s also designed to make the whole needle ordeal less painful for a patient using both an ultrasound-activated topical anaesthetic patch it automatically applies, and a rock-steady robotic hand which guides the needle in without any tremors.